This is just an all-round great appetizer. Think of this the next time you’re having people over, and want to serve something more impressive than chips and dips or a vegetable platter. This truly is a restaurant quality production, bursting with flavor, and really easy to put together. The most important aspect of this dish, in my opinion, is the idea and thought process behind it. The inspiration.. The flavors themselves are great: goat cheese, wild mushrooms, herbs, Italian fennel sausage, arugula… but it’s not the flavors that I’m concerned about. This crostini was inspired by a great pizza I ate at a small restaurant on the Sunset Strip in West Hollywood. It was an unexpected treat, and once again, got me thinking in new directions. We love pizzas and flatbread ‘artisan’ pies have been a trend for some time now. Why not take the flavors of our favorite pizzas and give them a new platform? Pizza dough is tough to make at home, and very few of us have ovens and equipment capable of making restaurant quality pizza. But anyone can cut French bread into crostinis. Anyone can buy good quality lavosh and add a bunch of things on top. Take the great ingredient pairings we find on great pizzas and put them on thin sliced French bread roasted with olive oil. It’s a great way to experience those remarkable flavors at home, at the mercy of your own hands. And so here we are, a wonderful crostini idea inspired by a pizza that really shouldn’t be made at home. It’s just a great classic pair prepared correctly. How many times have my recipes relied on that formula? I hope you enjoy this recipe as much as I do, but moreover, I hope the thought process behind it inspires you and pushes you in a similar direction. In a medium sized sauce pot, cover the sausage links with cold water. Bring to a simmer, simmer for 10 minutes, drain and rapidly cook the sausage. Slice the sausage on a slight bias into 1/4in think slices. Reserve. Heat an over to 400 degrees. In a hot sauce pan, add the butter and about 1 tbsp. olive oil. Saute the mushrooms until golden brown. Season with salt and pepper. When completely cooked through, remove the mushrooms from the pan and let drain on paper towels. In a mixing bowl, mix the goat cheese, roasted garlic and chives well. Reserve. Lay the crostinis on an oiled sheet pan (spraying a sheet pan, or cookie pan with cooking spray works). Drizzle the cristinis with a moderate amount of olive oil. Lightly spread the goat cheese mix on the cristinis (using the back of a spoon is a great trick for doing this). Evenly place the sausage, mushrooms and arugula on top. If there is any left over goat cheese, place it on top as dollops. Drizzle a little more olive on top and lightly season with black pepper. Roast until the cristinis are crunchy and lightly browned on top, about 15 minutes. Let cool slightly and serve right away. Best served with chilled Riesling. This is one of my favorites. All time, never fail, never lets me down, favorite things to make. I have served this countless times in restaurants, and have had repeat customers order it time and time again. The flavors are so familiar, let so Asian, and evoke the great ‘umami’ taste that so many of us strive for. Our taste buds are simple. We ‘taste’ 4 things: sweet, sour, bitter and salt. This is a scientific fact. Everything else, the subtleties, the nuances, the true flavors we experience are a derivative of taste and smell. We can smell thousands of unique aromas, and in combination with the 4 basic tastes, we experience flavor. And then there is umami. Umami is regarded by many as a basic taste. Basic, yes, but describing umami and acknowledging its presence is difficult, if you don’t know what it is. It lies on the outside of obvious flavor, and can be confused with a mix of sweet and salty. Umami is savory. 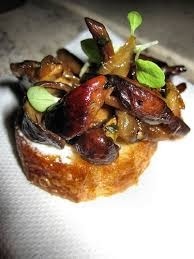 Umami is a savory delicious taste. It tastes like a rich miso soup, a rich mushroom broth, Chinese food (with msg and salt), soy sauce, Japanese dashi or bonito broths, and certain naturally occurring vegetables, like celery and tomatoes. Umami’s existence usually requires the assistance of salt to become, but is differentiated through the presence of the ‘delicious’ flavor, that your mouth can detect without the help of your nose. We use and enjoy umami on an every day basis. Doritos evoke umami, soy sauce on our food adds umami… It lends itself to Asian dishes very well, so why not take full advantage? I love sashimi. I love tuna. Sashimi grade tuna mixed with sesame, cucumber, shallots, scallions and naturally occurring umami, found in a well made ponzu sauce is delightful. It’s light, healthy, and bursting with flavor. 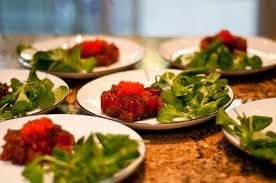 Below you will find my recipe for ponzu, which is really a tangy citrus soy sauce, and a Japanese inspired tuna tartar. This recipe is targeted for your ‘small bites’ needs, to work as an appetizer, canape or mid-course intermezzo. It’s easy to make, and I hope you like it as much as I do. In a small non-reactive sauce pot, begin reducing the rice wine vinegar, mirin, sake and kombu (or miso). When reduced by 3/4, add the sugar and soy sauce and reduce by about 1/4. Strain well and let cool. Add the yuzu. It should be thin, slightly tart and rich in umame flavor. Reserve. Very finely chop the tuna, ensuring that it stays as cold as possible. Mix the tuna with the cucumber, sesame oil, sesame seeds, sambal olek, shallot and scallions. Add about 2 tbsp of the ponzu and the white soy. 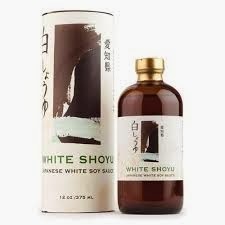 The white soy adds the necessary salinity; add enough until the mix is delicious. If you feel it’s accumulating too much liquid, use salt for the final seasoning. Serve right away on either crispy rice cakes, shrimp cakes or fried wontons. It’s also excellent as a canape; served with roasted puff pastry squares, toast points, fried taro chips, blinis or Okinawa sweet potato crisps or latkes. Topping with caviar (inexpensive tobiko) is appropriate.